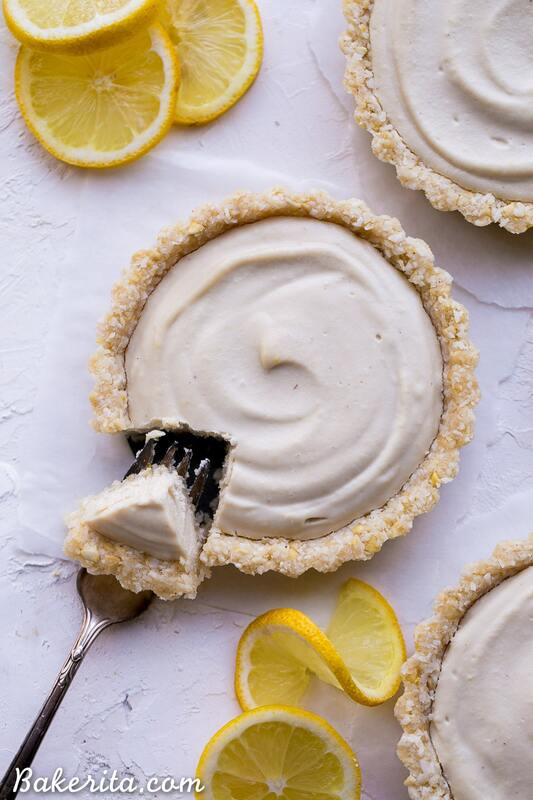 These No-Bake Lemon Tarts are easy to make with tart lemon flavor. The super creamy and bright lemon filling is perfectly complimented by the lemony cashew coconut crust. 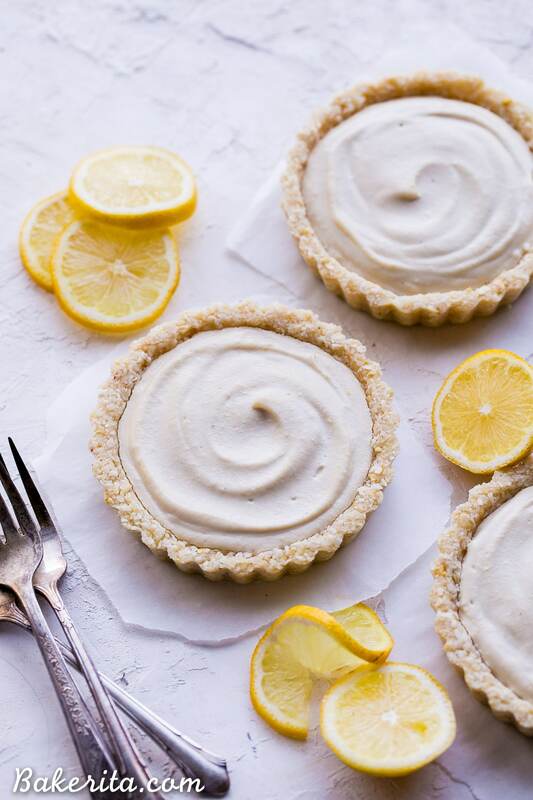 These gluten-free, Paleo and vegan tarts are perfect for warm days! I’ve probably mentioned it before, but lemon desserts typically are not my favorite. They have the tendency to be way too sweet, with way too much sugar compared to the amount of tart lemon. If I’m having a lemon dessert, I want IN YOUR FACE super tart lemon flavor. Don’t give me something that tastes like a lemon candy or something with so much sugar it makes me pucker up for the wrong reasons. It’s got to be full on LEMON, with all the brightness and tartness I love from fresh lemons. Oh, and it MUST have fresh lemon juice – don’t give me any of that bottled, artificial-tasting nonsense. If a lemon dessert doesn’t meet this qualifications, I’m skipping it. Sorry lemon cookies and cakes – you usually just don’t do it for me. I need more brightness than they usually have. There’s just not enough room for lots of tart lemon juice in there! 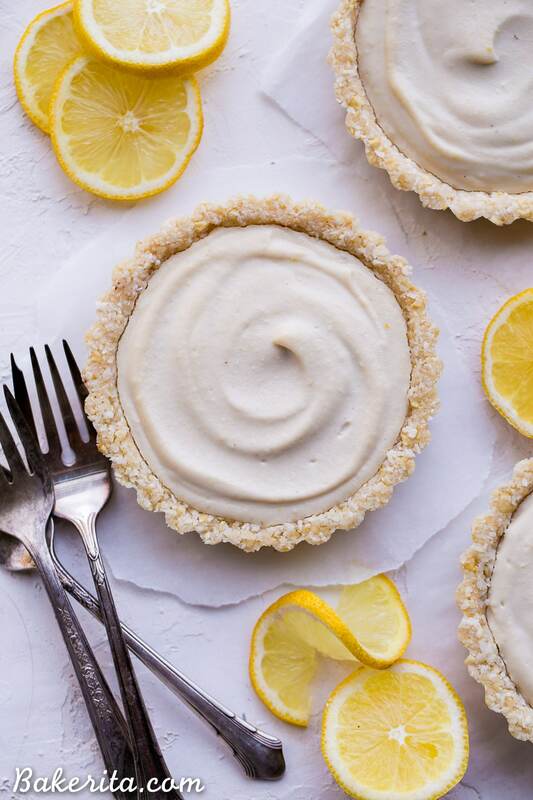 Luckily, these no-bake lemon tarts are the opposite of cloyingly sweet, and they’ve got ALL the bold, tart lemon flavor I dream of in my perfect lemon desserts. They’re one of the first steps in turning me into a lemon dessert lover. These started as a copycat of Hail Merry’s Miracle Lemon Tart. I got a baby version of it at Expo West, and kept it in my fridge for a while with the intention to reverse engineer it. And then I ate it one night, so when I went to recreate it, I didn’t remember exactly what it was like, except for that glorious super lemony filling. The filling is very similar, but I took some liberties with the crust, making a coconutty, cashew crust that I think works so well here. I will do a more similar one soon though, so watch out for a more legit copycat coming up! The coconut cashew crust provides such a delicious base though – I added lemon zest and juice to the crust too, so it adds a little extra zing. No part of the tart is left un-lemony! The filling is the real MVP though. It starts with soaked cashews, which provide a super creamy and smooth base. Along with a hearty dose of fresh lemon juice and zest, coconut oil, coconut milk, maple syrup, and a hint of vanilla and salt make an irresistible treat. The whole recipe is made in a blender or food processor – I used my Vitamix, as per usual. No need to wash between crust and filling too, which is always a plus  less dishes is always a win! Once your tarts are nice and chilled, you get to the good part: digging in. No lie, my eyes lit up like the heart-eyes emoji when I took a bite. The bite and chew of the coconut crust, paired with the super tart and creamy lemon filling, was pure lemon dessert perfection. So far from too sweet – it was just to my tastes. Even more surprising was my dad’s reaction though, because he could CARE LESS about lemon desserts, especially if something chocolatey is around. I brought these tarts to his house along with some squares of the chocolate peanut butter fudge and he first tasted the fudge, then the tarts, and liked the tarts better !!! I was shocked, and proud. That speaks volumes about these bites of lemon goodness! I couldn’t be more thrilled with how deliciously these turned out. 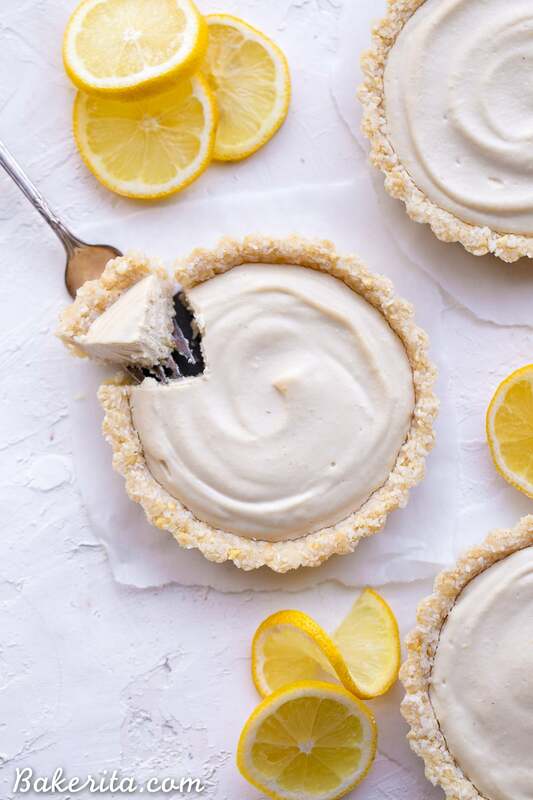 Bold and chewy lemon coconut crust, with the tart and vibrant creamy lemon filling – it’s pure lemon perfection, and since there’s no baking or cooking necessary, they’re perfect to whip up in the coming summer heat. They’re especially refreshing served nice and chilled – just what you want on a hot afternoon. 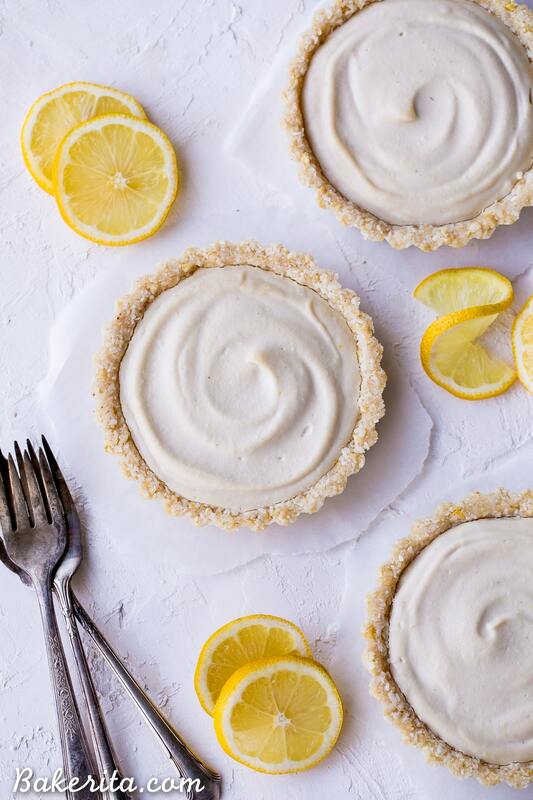 If you’re a tart lemon lover, I hope you’ll give these no-bake lemon tarts a try. Lightly grease three 4.75” tart pans or one 9” tart pan with coconut oil. For the crust, combine the shredded coconut and cashews in a food processor or high powered blender and pulse to combine and break up the cashews into smaller bits. Add the coconut oil, maple syrup, lemon juice, and lemon zest and pulse to combine, until it’s fully moistened and sticks together. In the same food processor or blender (no need to wash between), combine all of the ingredients in the filling. Turn the food processor or blender on medium-high and blend for about 2 minutes, or until the mixture is silky smooth and creamy. Scrape down the sides as necessary. You may need to add a bit more coconut milk or lemon juice to get it to blend smoothly if your blender isn’t super high-powered. Once it’s smooth, taste and adjust the maple syrup or lemon juice if desired, depending on your tastes. Pour the filling into the prepared crust and smooth the top. Place in the refrigerator for at least 1 hour to set before serving. Serve chilled, and keep any leftovers in the refrigerator (or freezer for longer storage). Rachel! Each dessert you create is better than the one before. Can I trade this piece of chocolate I’m eating for a lemony tart?! I am pretty addicted to the Hail Merry Coconut Tart and the Chocolate Almond Butter is a close second. But I do try to make similar treats at home – it’s a fun challenge! Oh, btw, since you like bold lemon flavor, you should consider using lemon essential oil in desserts. One or two drops is all you need. I added it to some homemade vegan/paleo white chocolate and the flavor was heavenly! I was waiting for this recipe since I saw it on your Instagram stories! Also, I totally agree with you about lemon desserts. I need to try this! These look and sound absolutely delicious. Totally with you on the lemon thing by the way, unless it’s actually lemony and sour, I don’t want it! I want to make these for a party this weekend but don’t want to buy tons of mini tart pans. Will the crust hold up if after firming in the freezer I remove the tarts and reuse the pans to make several batches? Thanks in advance! Really excited to try this recipe. Hi Melissa, yes these will stay firm after removing from the tart pan! I took them out of the pans and they stayed as is until they got devoured :) Hope you love them! 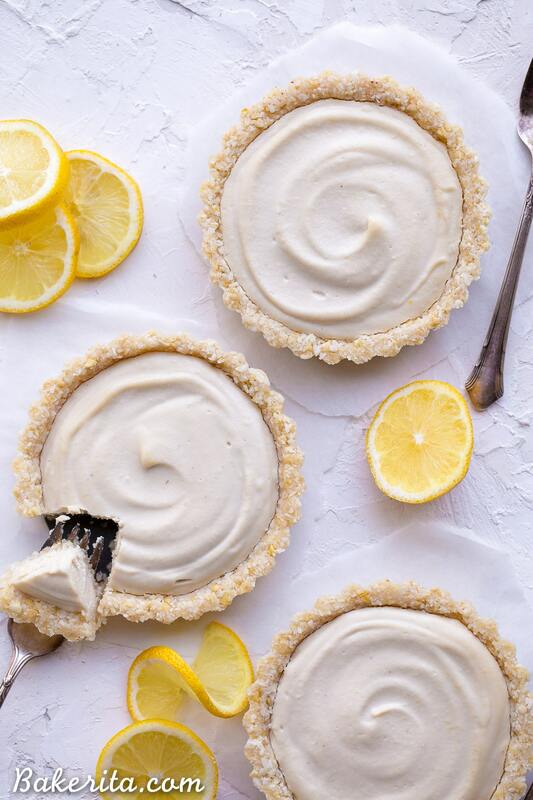 Looking forward to making these lemon tarts. Thank you for such amazing recipes! Hello! These look so good! Do you happen to have the nutritional info for them? Thanks! Hi Shelly, I just updated the recipe to include nutritional info. Can’t wait to make these! Do the tins need to have removeable bottoms or should they come out of standard tins easily ? Just make sure the tin is greased well and you should be able to get them out of any tin pretty easily! Just make sure the crust is tightly packed so it doesn’t crumble apart. Enjoy! 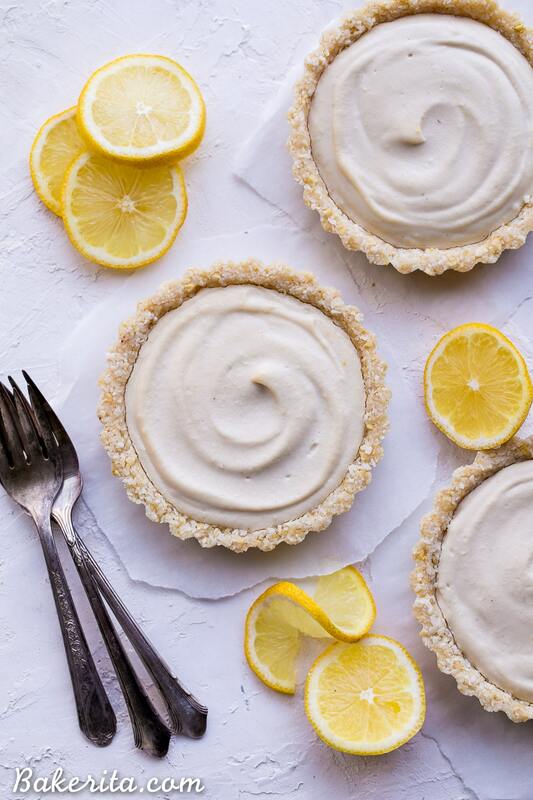 Your No Bake Lemon Tarts recipe is fantastic! Hi Katherine, thanks for the love! You can use a photo with linkback credit to my site. I appreciate you asking! Recently, health issues have forced me to become vegetarian and have been fodmapping. So saw these and decided to give it a go. This is the most fabulous lemon tart I have ever experienced. Do yourself a favor and make this recipe. It’s a winner! I don’t have any tart pans. Can I use a pie pan? Or a springform pan? I want to make it into. July 4th berry tart! Any suggestions? Hi Maria, I would double the recipe to put it in a 6″ springform pan, or 2.5 – 3x the recipe for a pie pan or 8″ springform pan. Just add berries on top when you’re ready to serve :) enjoy! Everyone was shocked that there wasn’t any cream cheese in them to make it so smooth and creamy! I absolutely love using lemons during the summer in recipes, and this one sure did not disappoint! What could substitute cashews if someone is allergic? I haven’t tested anything else, but macadamia nuts would likely work!